Is there anything more fun than pretending to be 19th century Japanese industrialists? I don’t think so. 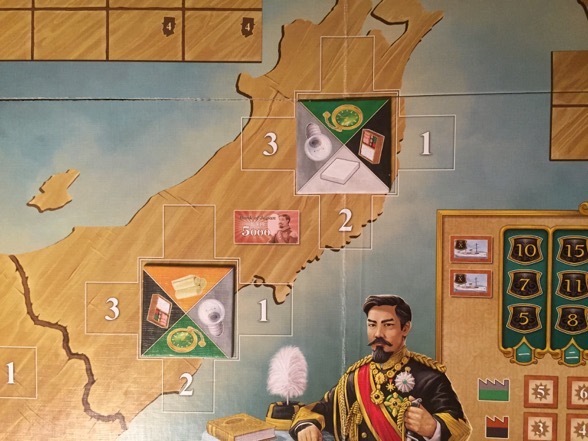 Luckily for us, there’s a fantastic new game on shelves that captures the thrill of modernizing Japan, all from the comfort of your dining room table. Finally, the zaibatsu simulation you’ve always wanted. This madness is called Nippon, and please do not let my snarky tone confuse you: the game is awesome. Players will ascend to great, industrialized heights, thanks to savvy investments in lightbulbs and bento boxes and other exciting goods (paper, anyone?). Factories will rise, infrastructures will grow, and influence will blossom across the island of Japan. Also, your brain may just turn into a pretzel. But what a fun pretzel it will be! Nippon has been categorized as a “heavy Euro,” which is not to say that it resembles the ghost of Pavarotti. 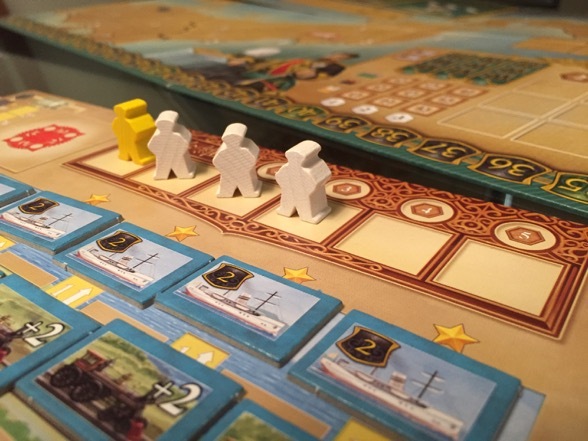 In board game parlance, a “heavy Euro” is short for “heavyweight Eurogame,” a highly strategic game that demands its players think several steps ahead in order to achieve success. This usually boils down to decisions — hundreds and hundreds of decisions that unfurl like messy flowcharts inside your brain. For some people, this analytical approach is hellish. For others, like me, it’s the BEST. 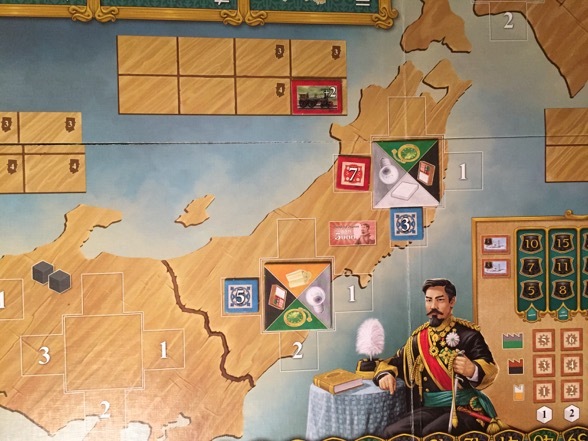 The joy of Nippon is adopting a strategy and carefully nurturing it all the way to victory. 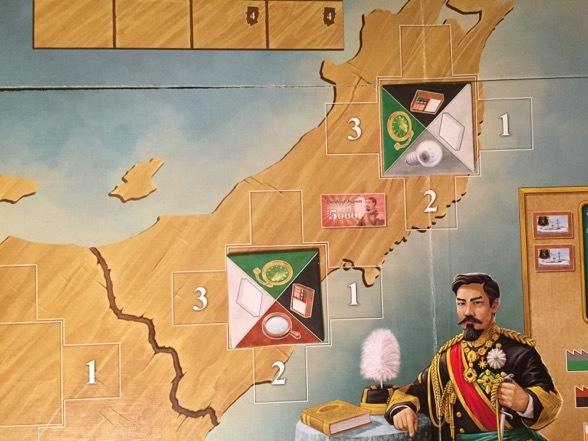 A successful approach will see players building a glorious engine; one that will yield a great influx of resources, which in turn will exert influence across a map of Japan. However, things can go wrong very easily. Engines break. Opponents meddle. Resources dwindle. One wrong move, and you could be staring at an empty clock factory, wondering why you ever thought it was a good idea to build the damn thing when you don’t have any coal to power it. Every turn, players have a variety of actions to choose. They may purchase a factory for a few thousand yen; although, the more advanced the factory, the more “knowledge” they’ll need. No problem: players can also spend some money and advance on a knowledge track. Still don’t have enough knowledge to build that lightbulb factory you want? Well, keep an eye out for “blueprints” — bonuses that can temporarily bridge the difference between the knowledge you have and the knowledge you need to invest in a factory. Once players have factories, they may use an action to produce goods (silk or lenses or clocks, to name a few). This requires coal, and the more advanced the factory, the more coal is needed to produce an item. Well, just like knowledge, there’s a coal track, and as another action, players can spend money to advance on that track too, which results in a coal influx later on. The good news is that just like blueprints, there are plenty of coal bonuses around to help keep the factories running (theoretically). 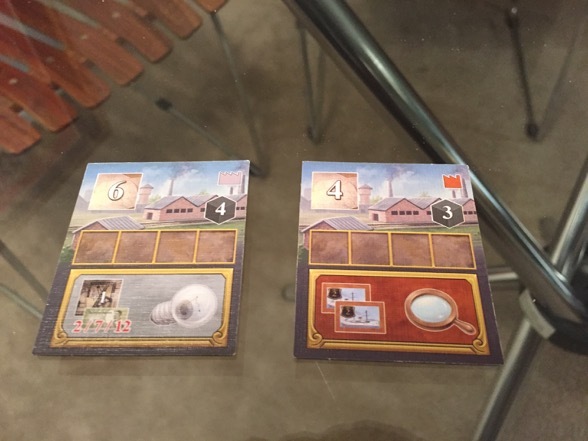 Of course, when it comes to production, one always benefits from efficiency, and for a pretty penny, players can install machinery into their factories to help boost output. In fact, players can also upgrade said machinery so that the factory is super productive. Now a factory can churn out up to 3x the amount of goods with the same amount of coal. Huzzah! The factory on the left requires six knowledge (hence the 6) to be purchased. The one on the right only requires four. Additionally, it takes four coal (hence the 4) to produce one cube in the lightbulb factory whereas it only takes three coal to produce one cube in the lens factory. Lens factories require less to produce, but lightbulbs yield greater influence. Behold the glory of machinery! The lightbulb factory not only has a machine, but an upgraded machine. That means that four coal produces two additional cubes for a total of three (there are four cubes in the factory because, you know, someone must have produced earlier). The paper factory has a basic machine, which gives a +1 boost. Two cubes of coal thus produce two goods in the factory (the cubes represent products when they’re in a factory). The crappy lens factory has no upgrades, and so it still requires three coal to produce one lousy good. Nice efficiency, LENSES. So, to summarize, players can invest in factories, improve factories, produce in factories, increase their knowledge for better factories, and up their coal stores. 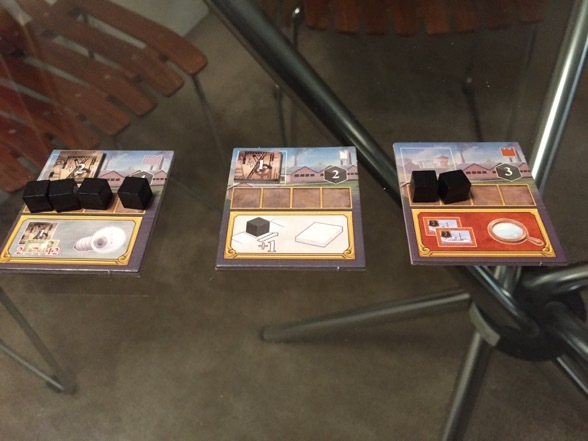 As players produce in their factories, they will then have an inventory of goods on their hands that need to be shipped on out. One option is to export these items to foreign markets. This involves producing some combination of goods, usually something like two items from one factory, two from another, and one from a third. It all depends on the foreign contract tiles sitting in front of you, each of which will yield a notable reward upon fulfillment. A foreign contract requiring two goods from two different factories and one good for a third. The reward is nine points and an increase in income by one. A more significant way to flex a player’s economic muscle, however, comes from selling goods on the domestic market (a.k.a. in Japan). When players do this, they gain a certain amount of influence in a region based on the good and the quantity being sold. This here is the heart of the game because it’s the influence that brings in the victory points. Over the course of the game, players will be producing goods, selling them, and throwing down influence all across Japan. The key here though is that one player’s influence can be supplanted by another’s if it’s larger, and if that happens at the wrong time, someone could miss out on a huge amount of points. And thus, Nippon suddenly becomes not just a pleasant exercise in supply-chain economics but a tense battle for power. Players must consider whether they want to eke out some quick goods in order to nab some cheap influence on the map; or produce large amounts of expensive items, which may take longer to churn out but offer a higher, more stable influence. Plus, there’s the added wrinkle that each player has a limited number of influence tiles (e.g. only one influence “1,” two of “3” and so on). These are all the influence tiles each player gets. Remember that once you use that four, for instance, you can’t use it again until someone bumps it off the board. It’s pretty common for someone to be ready to make a big move and then suddenly realize they don’t have the influence tile they need anymore. Womp womp. Obviously a more stable influence is better, but it could take so long to achieve that players may miss out on some important opportunities, such as regional bonuses. You see, every time a player exerts influence in a region, that region yields a bonus of cash or coal or blueprints or points. Therefore, players who toss some easy influence around will get back the resources they’ll need to build their empire. However, they’ll most likely be muscled out of regions in subsequent turns, which could lead to a loss of up to twenty points, and let’s not forget that most points wins. There’s a huge push-pull in this portion of the game. It’s tense, frustrating, occasionally theatrical, and definitely super fun. Of course, when it comes to influence, there are ways to bolster one’s presence. 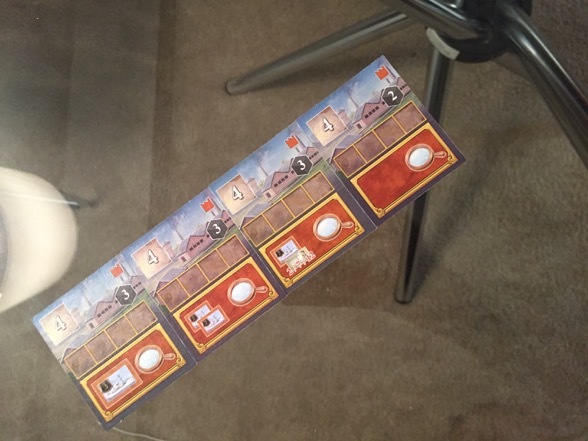 As another action (yes, there are more actions), players can drop some dough and build train lines. This can add several influence points to a region (assuming someone already has a base level of influence there), and when a scoring round arrives, the trains could be the make-it or break-it factor. 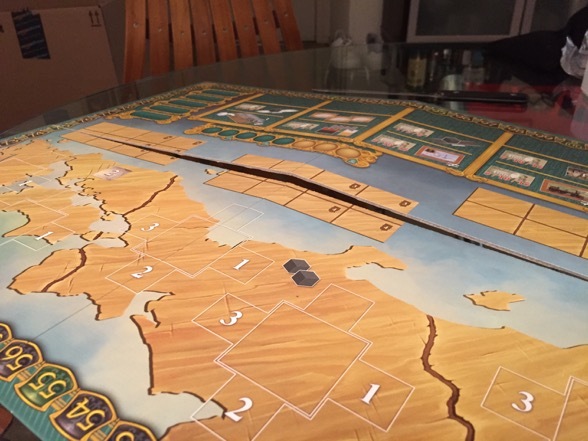 And then, as a last action, players can invest in shipping routes, which add points to one’s tally during a scoring phase. I have never found much luck with ships, but I have faith that there’s a way to use them successfully. As for those scoring phases, at certain points in the game, the action stops, and every region in Japan is analyzed. Whoever has the most influence in each area receives a nice chunk of points. Second most earns a lesser but still respectable number. Third place gets a bone thrown their way, and fourth place gets NOTHING. It should be noted that there is a foreign influence in every region too, which can play spoiler to those scoring rankings. Two cities, each with four demands. Placing influence in either city will reward the player 5,000 yen (as indicated by the picture of cash between the cities). The numbers on the board indicate foreign influence and only matter when calculating regional influence during a scoring phase. Right now the foreign influence is 12. Cities are placed randomly. In this case, the rightmost city is the same tile as above — but rotated. 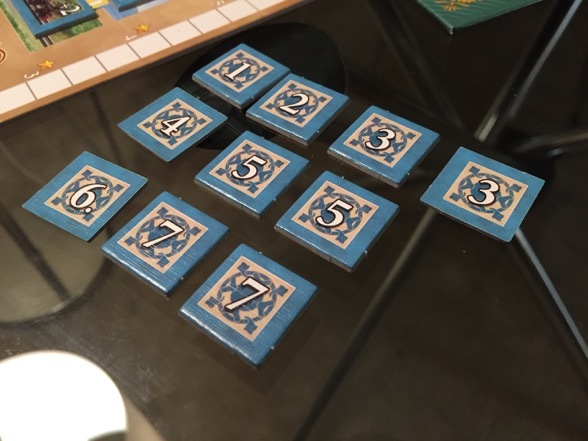 Previously, there had been no foreign influence in that city due to clock demand, but in this photo, the foreign demand is three, which may motivate players to build influence there (by placing an influence tile over the three, the foreign influence drop down by three, which could be important). Additionally, in this photo, players may no longer exert influence with silk (but they may sell lenses to this market now instead for influence). The power of variable setup! Going back to the original setup, the blue player has now exerted influence in two different cities, bringing its total influence to eight. Foreign influence is a lowly seven. HA! It should be noted that any number can be placed over foreign influence, but only higher numbers can bump player influence tiles. The economic drama continues! The red player lands a whopping seven lightbulb-fueled influence points (the highest number, which means it can’t be replaced). Thanks to red’s train, that player’s total influence is nine, which moves blue into second place for scoring. SO FUN. 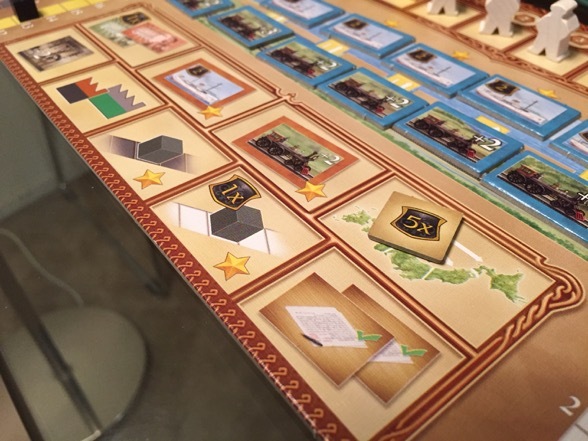 So, to review again, players can build factories, improve factories, produce in factories, sell goods to foreign markets, sell goods and gain influence in domestic markets, invest in train lines to increase influence, and build shipping lines to reap greater rewards. Oh, and also increase knowledge and coal. It’s actually all very simple if you really think about it. Right? Right? Don’t get too comfortable: we’re not done. There are two other major game mechanics. First is how players go about their business. 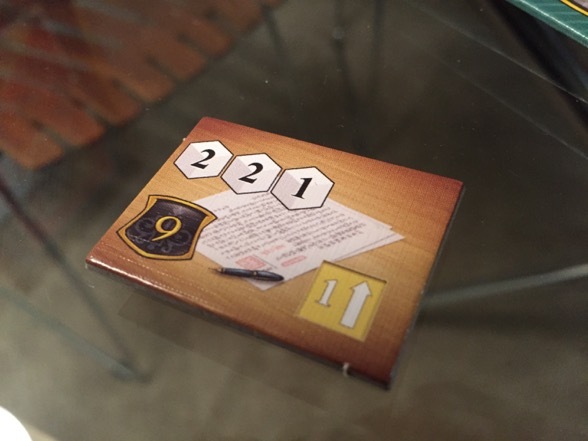 In order to select an action, players take a meeple that’s standing by the action in question. Each action space will start with three meeples, and as players pluck them away, they’ll eventually be refilled by a small pool of meeples standing in a glorified on-deck area. Once there are no more meeples on-deck, the game timer advances to a new round, and all the meeple gaps are filled in by pulling new, random meeples from a bag. In order to build a train or make a factory improvement, players must take one of the three meeples above those actions. 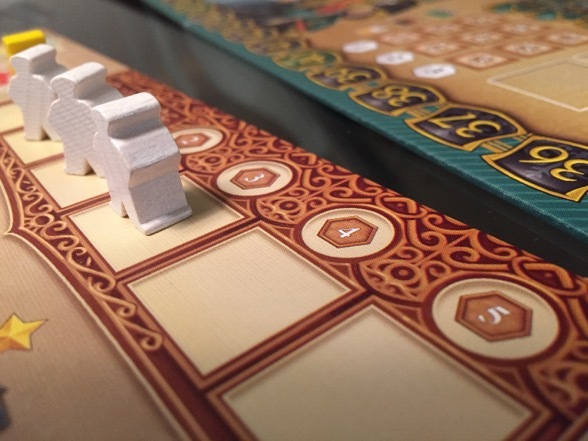 There are only two meeples left above the rightmost action (that’s the action to exert influence in the domestic market, in case you were wondering). The pulling of the meeples must be randomized because they come in six different colors, and yes, color matters in this game. You see, every player has a little player board all to themselves. That’s where they keep track of their money, their coal, their knowledge, and — importantly — the meeples they grab when they take their actions. Players can only collect six meeples max, and at that point they must forgo doing an action and instead CONSOLIDATE. Consolidation has players refilling their coffers with money and coal (yay!) but also paying their workers (boo!). One must pay 3,000 yen per meeple color, and unsurprisingly, that tab can add up quickly. This, of course, totally affects the way players select their actions as it is more economical to take meeples of colors already on their player board. For instance, taking on two black meeples and one red meeple isn’t the worst thing in the world, but adding a blue meeple into the mix could seriously hamper that player’s finances. Suddenly, that person will be paying 9,000 yen, which is a serious chunk of money, especially as players only begin with an “allowance” of 12,000 yen (and most actions cost between 1,000 and 15,000 yen). Thanks to this color situation, action selection becomes a whole lot trickier — and strategic. In addition to everything else that’s happening in the game, players now have to think about when they take their colors, where they take their colors, and how they can force other people to take on additional colors. Every action is available to every person at all times, but the question is: do you want to pay for it? The good news with consolidation is that players can do it at any time, not just when they’ve used six meeples. However, the more actions that players take before consolidating, the bigger of a bonus they’ll get at the end of the game. This player has room for two more actions before a mandatory consolidation (assuming they had the resources to do two more actions). If this person consolidates now, they’ll get a 3x multiplier for an end game win condition. BUT if they fill up all their slots before consolidating, they’ll get a 5x multiplier (hence the numbers on the slots). Multipliers give players an immediate bonus (either cash, coal, or blueprints), and then they are placed on one of these options where they’ll remain the rest of the game. In this case, a 5x multiplier means this player will get 5 points for every region they have influence in at the end of the game. Not only is this a nifty way to get points, but it can seriously shape your strategy. There are bonuses everywhere in this game: after consolidation, after exerting influence, and after building a factory. I can’t get into them all here — I’ve already devoted way too much real estate to describing the flow of the game — but suffice it to say, the bonuses are essential to success. They either keep the engine running or provide a suddenly influx of points at the end of the game (which in turn will massively shape a longterm strategy). I sincerely hope this doesn’t all sound overwhelming, and even if it does, please trust me when I say that the game flows extraordinarily smoothly. It’s a brilliant design and full of so many tough but entertaining choices, nearly all of which revolve around timing. There’s a nagging tug-of-war between longterm goals and short term gains, and I’ll be damned if I’ve found the balance. It should be noted that a prominent game reviewer recently found fault with the open nature of Nippon, objecting to the fact that players could essentially follow the same strategy every time. He claimed the game was too much of a sandbox, and it therefore made replaying Nippon less exciting. I could understand where he was coming from: what’s the fun in always going for a factory on the first play, followed by machinery, followed by x, y, and z? I respect and understand his critique, but truthfully, I’m not sure it’s totally merited. Players could certainly kick off each game in the same way, but very quickly, they’ll have to revise their strategies. Meeple colors will affect action selections, and ever changing city demands will impact where it’s most advantageous to exert influence. Perhaps with just two players, the game could get a bit same-y, but with three or more, it’s an unpredictable economic monster (in a good way), and there’s just no way that someone could simply waltz through the game with the same strategy over and over again. And if they did, their opponents would be sure to pick up on it and cut them off at the pass. 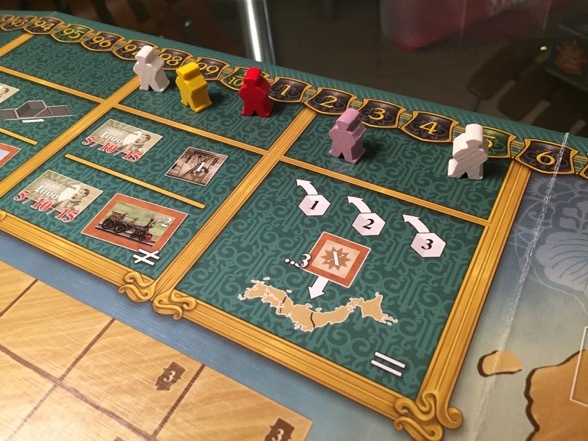 Nippon is not a hard game to grasp, but it takes a little bit of time to explain everything. However, once it’s up and running, things move fast and furious. The area control and action selection mechanics keep player interaction high. Sure, you’ll be focused intensely on your own little zaibatsu, but be warned: those who don’t keep tabs on their opponents’ player boards are bound to suffer major losses. On top of all that, there’s the thrill of building an economic engine (trust me, it really is a thrill), and if that weren’t lovely enough, most factories provides a unique, ongoing advantage, which means players can delight in having asymmetrical powers. And who doesn’t love that? As for components, the artwork on display is fine. I’m happy with it. 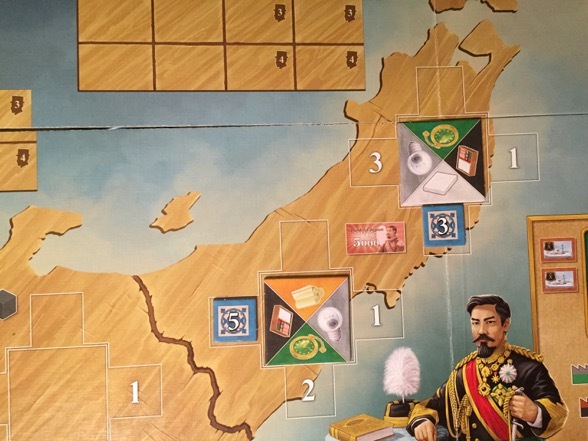 My only real issue is with the board, which absolutely refuses to lay flat, instead warping upwards and creating a veritable fault line that cuts across Japan (perhaps too realistically? And for the record, I just experienced an earthquake here in Los Angeles as I wrote this). Hunt this one down, people! 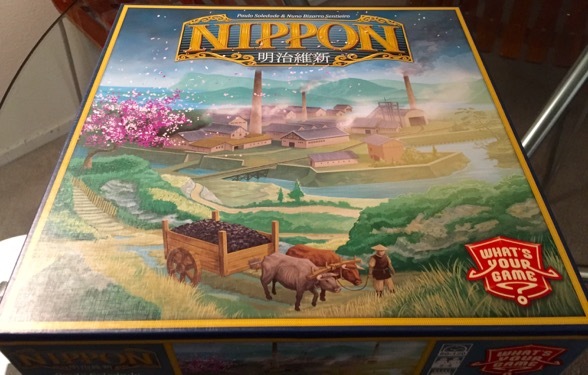 This entry was posted in Games, Reviews and tagged board games, boardgames, games, Nippon by Ben Mandelker. Bookmark the permalink.